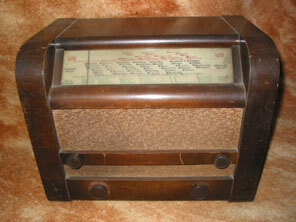 The receiver shown on this page is the A58. This would have been made in about 1937 or 1938. 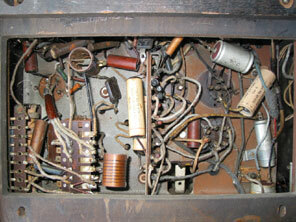 It is a 4 valve plus rectifier superhet, with no particularly interesting features. The cabinet is veneered oak wood and is reasonably stylish though not exceptional. It continues to remain part of the collection purely on the grounds of rarity. Valve line-up is TX4, VP4B, DDT4, APP4C, APV4. 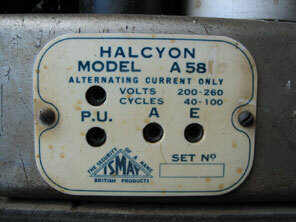 I have labelled this receiver A58, but inspection of the close-up of the model number plate (picture below right) suggests that the model number may have been longer at one time. Further digits appear to have been scratched out, possibly "1" and "0". Additionally, there has never been a serial number entered into the "Set No" box. Could it have been a development receiver during its life? Or perhaps assembled by one of the staff at the factory for own use rather than public sale? 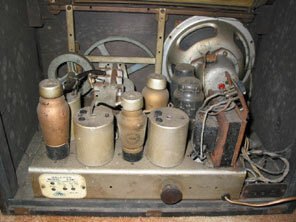 As well as their pre-war television mentioned on the previous page, they also offered a radio that featured a limited remote control. The only major manufacturers to offer any other form of remote control were Murphy and R.G.D, so this would have been quite a selling point for Halcyon, though again I have never seen a surviving example. That's it for Halycon, a manufacturer of whom comparatively few sets seem to survive today. Although a small manufacturer it does seem they had the potential to develop some innovative ideas.